Latest from E!Online. Click the 'read more' button for some scoop about the 7th season of Dexter from executive producer Sara Colleton. Off the Rails: When Dexter is out of control it's usually when he gets into the most trouble. And when it comes to his sister, he's feeling a bit out of sorts. So will his dark passenger take control and start slicing? Or will Dexter refocus his energy? Executive producer Sara Colleton tells us that Deb learning his secret has "absolutely rocked his world. He has to learn to live with at any moment she could, if she wanted, to turn him in." 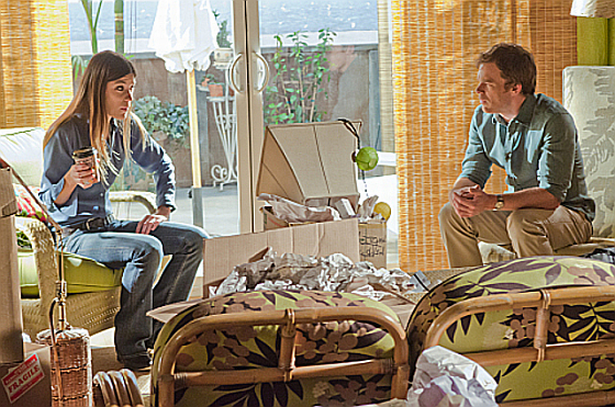 Under Pressure: Dexter isn't the only one struggling with this secret. Deb is also struggling to accept it. "It's a very treacherous path that she's going to navigate week to week," Colleton reveals. So even if Deb doesn't come clean instantly, it doesn't mean she won't. Old Wounds: Nothing ever stays buried forever. And LaGuerta (Lauren Vélez) could be on the path to discovering what she's believed all along, that her friend Sgt. Doakes wasn't the Bay Harbor Butcher. Colleton says she'll be "relentless" in her search for the truth.